From digital two way communication devices to actual monitors that show on your phone or computer, M&D has the right intercom system for you. M&D Locks and Keys stocks various intercom systems for your home and office. The intercom system is basically a dedicated phone line between two fixed points. They’re very easy to use and enable one to communicate to a person outside the premises before entry is granted. Over the years, intercom units have gotten more sophisticated and are usually digitally programmed for better security. We also incorporate monitors and security cameras in conjunction with an intercom system for even better security. Intercom units have come a long way. now you can have two-way communication at any entry point in your home and business. these are top of the line systems that will let you know who’s there before you grant access. Intercom units are not just voice systems anymore. Now you can see who’s at the door and even grant them access right from your phone or computer. Ask us about all the options with your new intercom system. 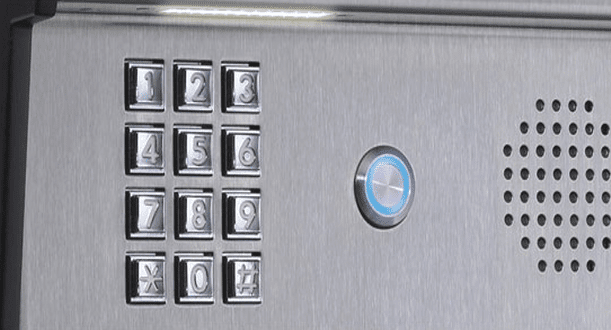 Integrate your intercom unit with your CCTV security cameras and remote access devices. M&D will give your home a business complete security and protection with the best from Bosch, Toshiba and Mul-T-Lock. All our M&D technicians are trained specifically for intercom and security camera installation. They will evaluate your security needs and survey your business or home to recommend the right system for you. Whether it is the highly popular AM490, master to sub system, CP202SS, 142 or any of the advanced dial video intercom units, we’ll make sure to find a system that fits both your needs and your budget. Some consumers decide not to get an intercom system because they believe it serves the same purpose as a cell phone, but the new units are integrated with security camera installations and are far better than “ringing” someone in with a phone. Intercoms are generally not tied to the airwaves and are more private. If employed with a security camera, they allow you to view the person before granting access. Finally, they can be specially programed by a trained professional to meet certain disability and other needs that restrict usage. Can you install an intercom system yourself? We don’t recommend it. These systems can be very complicated and if you don’t know the difference between a sub-station, wall mount station, door station or intercom station, then you should at least obtain professional advice before doing it yourself. The wiring of intercoms can be tricky as well. There are the older, but still popular two-wire party-line broadcast systems and the newer, four-wire matrix broadcast systems, which use four-wire circuit technology. The latest units even incorporate wireless technology, though they are a bit more expensive. Call us at (718) 484-4050 to find out more. How do I get started with a new intercom system? First, make an appointment with an M&D expert by calling us at (718) 484-4050 or you can submit a service request here. One of our technicians will meet with you to discuss your security needs and to survey the area to be covered. Based on this consultation, we’ll make several recommendations that fit within your budget. In most cases we’ll have all product on hand to install your system as soon as you are ready. Once your system is installed, we’ll recommend the best ways to get the most out of your system. We will not leave until you are comfortable operating your system on your own. Furthermore, should you have any concerns after installation, we are always available to answer any questions you have. If you are happy with our products and service, then we hope you will write a review for us in any of the online customer review sites such as Google and Yelp. To get started, please contact us today at (718) 484-4050.